FISHER & SHEPARD, ARCHITECTS & PLANNERS, INC.
ring in the late 19th and 20th centuries, which is well documented and understood. The Report consists of two parts. This written summary comprises the first part. inspiration and guide to all. The following procedures were employed in the preparation of this Report. 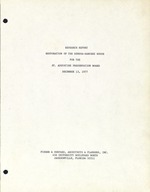 Almost all historical documentation has been provided by the Board's staff. theses regarding early construction sequences are a result of these discussions. by the National Park Service and the National Trust for Historic Preservation. documented, removed, and stored elsewhere. provide expertise in the field of plumbing, electrical and HVAC systems. architectural evidence related to the historical report is listed below. Please refer to the Appendix for the historical documentation. of convenience, this report refers to the portion of the house fronting St.
development, the East Wing includes the Kitchen. b. First Spanish Period (1763; Antonio de Mesa, Owner). of the West Wing date from Stout or before. structure between 1784 and 1788.
quired before definite conclusions can be made. these assumptions while archaeological evidence to date is inconclusive. reused. Further investigation is required when the roof covering is removed. this area, since the south extension of the West Wing is not shown. ing structure postdates Rocque and cannot support or refute the Rocque Map. that this wall is shown incorrectly on Rocque. structed by Sanchez prior to 1791.
stair of the Sanchez period for it blocks an exterior window of the East Wing. earlier balcony east of the West Wing. in an opening on the second floor of the Fatio House. and that the second floor had not been extended above it. the period 1803 through 1832.
e. American Period (1821 present). however, the change in price may well be due to the changing economic times. agreement to repair the house is recorded with the deed. indicates construction took place between 1803 and 1888.
of window shutters can be discerned clearly. The earliest Sanborn Insurance Map exhibiting this building is dated 1888.
remains essentially as shown on the 1924 and 1930 maps. braces were added below the balcony at this time. scored ashlar stucco is still visible on the north wall of the West Wing. the balcony to the ground at the east end of the building. essentially as shown in the 1938 photographs taken by Wolfe. Historic District or the Master Plan, in the opinion of the Architect. and modified on the interior to house-plumbing and HVAC equipment. accordance with the directives of the Board and the Master Plan. b. Structural Conditions and Areas of Concern. west walls by means of straps or other mechanical devices. for deterioration when finishes are removed. roof framing are almost completely deteriorated and must be replaced. to view. All exterior coquina should be stuccoed to prevent further damage. place from earliest construction through the 1950's. tion must address this problem. rooms should be provided on each floor in the 1893-99 addition. may be necessary behind furnishings in walls. d. Detailed Scope and Cost Estimate. and Using Agency's contingencies are not included. with 190 feet of rived board fence......................... 1,700.00 "
15. Patch, clean and stain masonry floor. Alternate: 1-1/2"
NOTE: The above figures include overhead and profit for subcontractors. Overhead for a general contractor is included, but no profit. pared for comparison with the architectural drawings and historic documents. except the north-south dimension was considerably less. (b) Identical in overall dimensions to the present West Wing. (c) With a one-story East Wing as in (3) below. with a balcony on the east side. (c) Identical to (2)(b) above, but without a balcony. (a) Identical to the 1788 Rocque Map and key. to the east by Sanchez. (a) Added a one-story south extension to (1)(a) above. (b) Added a second floor to (1)(a) above. (c) Accomplished (4)(a) and (4)(b) at the same time. (d) Added a second floor to (l)(b) above. above exactly as shown by Rocque. (h) Enlarged a one-room East Wing built by Stout. out-of-scale) work accomplished by Stout and purchased by Sanchez. across the east face of the West Wing. width of the present south rooms of the East Wing. (a) Did nothing more to the house. pare a joint interim report to be used as an aid in restoration. particularly at wall plates and above Rooms 203, 204 and 207.
doors, frames, sash, and trim by date, as far as possible. may have extended to the east rather than turn at the landing. reasonably accurate knowledge of construction sequences and approximate dates. Examination of the building should continue until restoration is complete. A final joint report should then be issued by all involved professionals. (1) construction materials of all houses in St.
(1) export company contracted to supply St.
a. 36 ft. x 256 ft.
a. 47 ft. x 159 ft.
b. addition of 11 ft. to the south and loss of 97 ft.
left by Don Juan Sanchez, who died intestate. the heirs present, we began the appraisal in the following manner. Source: Real Academia Espanola, Diccionario de la lengua espanola, 1970. Citaron thin masonry partition wall. Appraisal of the Small House. Block 7, no. (Appraisal of Rodriguez-Avero-Sanchez House follows. ~: ~ 1 9 L .
.~ I 1 .s b9. .
*1 :. .. ~~ -~ ." .I...... ... .. -. .
115 2-10-1/4 x 6-5-1/2 x 1-3/16"
the title "Window Details at Old Spanish Inn, St. Augustine, Florida". place in December 1977 were as shown on these tracings except as noted. Dates noted "(Parker)" were determined from Appendix 8 and field evidence. lites; recent frame. See comments at 4.
ments probably added by Bath. Six lite fixed (?) sash and frame. metal keeper at left jamb. Same as 13, but no keeper. revival head added; metal keeper. Recent 6/6 sash in recent frame; double hung. Evidence of window opening; plastered over. in size to 21, 22, 23. Now missing, but shown on HSAPB drawings. these are scrap material measuring approximately 5 by 1/2. The latter seems to be more possible. 12, and it is obvious at the ridge that the angle thus formed is less than. work was redone. Everything iron new 1959.
cut off and shortened when they started. was poured 1959. Always infringed into the street. were all made up of plywood, picture molding and one-by stuff. They were made up of 2 & 3 panel doors left in the building itself. door overhang arrangement was added later. Center door was there doors weremade from doors found in the Inn. Frame (casing) was scabbed'on. Sash was all replaced. DOOR 101 A Casing faced and worked in to match architects drawings. Doors again were made up of doors found in the Inn. was there when job started. ROOM 110 Casing left, door replaced window, original sash. Iron work by Ivan Smith. UPSTAIRS Nothing done except addition of two grills. Some demolition took place in the rear of the building. A small wooden addition. Back steps were there in '59. Left as was demolition took place behind little wall. room. It was a wooden addition. punched in and the well set on top of it. northwest corner existed at the time. whole area was lathed and covered with plaster. A Victorian type arch wallpaper and plaster. were cut in on the level of the second floor. opening filled in with concrete block. some deflection upstairs. This was done after '59. West wall was added and east wall of front room. boards and woodwork except casings were replaced. Peeled entirely of plaster and left with cowuina. S,-six or small multi pane sash, they left it. Anywhere they didn't, they replaced it. by Mr.Parker in '59. The mantel was a shambles. They peeled all the plaster off. This was all part of the little wooden addition. up there was done by someone else. None of upper porch was touched. that the whole roof would have to be rebuilt. were in '59. The balcony was replaced. Mr. and Mrs. Bath stayed upstairs part-time. bedroom.' The rest was shut up. Were there, the ones downstairs weren't.